Say, "Glory be to my Lord! Am I anything more than a mortal messenger?" (Al-Isra 17:93). The sixth characteristic of the Islamic concept is its realism. This concept deals with objective realities whose existence is certain and whose effects are positive and concrete. Mere abstract ideas or unat­tainable ideals that are not functional in the real world are not its concern. The system of life that it delineates for mankind is realistic and eminently practical because it is designed by Allah to be implemented in human societies. At the same time, this system calls for a realistic idealism or an ideal realism because it demands a very high level of performance from the human beings and great perfection in conduct and behavior. Let us elaborate on these aspects of the Islamic concept. The Islamic concept deals with objective realities whose existence is certain and whose effects are positive and concrete. These realities are the actions of the Divine Being as He manifests Himself actively and positively in the world of events, the reality of the physical universe as it is felt and seen, and the reality of man as manifested in individual persons throughout the world. The Divine Being with whom the Islamic concept deals is Allah, Who alone possesses Divine attributes manifested in the real world. These attributes are not something abstract or relegated to the realm of metaphysics because their effects are concrete and observable in the physical universe, and because the human intellect is capable of recognizing these effects as the creation of Allah Most High. Extol Allah's limitless glory when you enter upon the evening hours and when you rise for morning prayers. To Him is due all praise in the heavens and earth, so (glorify Him) also during the sun's decline and at noon. He brings forth the living from the dead, and brings forth the dead from the living, and He revives the earth after it is dead. In a like manner you shall be brought forth. And among His signs is that He created you from dust, and then, behold, you become human beings ranging far and wide. And among His signs is that He created for you spouses out of your own kind so that you might dwell with them in tranquility, and He engenders love and tenderness be­tween you. Surely in this are signs for a people who reflect. And among His signs is the creation of the heavens and earth, and the variety of your languages and colors. Surely in this are signs for all who are endowed with (innate knowledge. And among His signs is your sleep during the night or day, and your (ability to go about in) quest of some of His bounties. Surely in this are signs for a people who (are willing to) listen! And among His signs is that He shows you lightning, causing both fear and hope, and that He sends down rain from the sky and with it revives the earth after it is dead. Surely in this are signs for a people who use their reason. And among His signs is that the heaven and earth stand firm by His command. (Remember all this, for )in the end when He will call you forth from the earth by a single call you will (all) emerge (for judgement). To Him belongs every being in the heavens and the earth. All are obedient to Him. And it is He Who originates creation, then recreates it. And it is most easy for Him, since His is the essence of all that is sublime in the heavens and on earth, and He alone is the All-Mighty, the All-Wise (Al-Rum 30: 17­27). It is Allah Who splits the grain and the date-stone, brings forth the living from the dead and brings forth the dead from the living. That is Allah; then how are you deluded away from the truth? He makes the dawn appear, and has made the night for resting, and the sun and moon for the reckoning (of time). Such is the judgement and ordering of the All-Mighty, the All-Knowing. It is He Who has ap­pointed for you the stars, so that by them you might be guided in the darknesses, whether on land or sea. We thus explain Our signs for a people who have knowledge. It is He Who produced you from a single person; and then there is a place of sojourn and a place of departure. We detail our signs for a people who understand. It is He Who sends down water from the sky. With it We bring forth the shoot of every plant and then We bring forth the green leaf of it, producing from it grain heaped up (at harvest); and out of the palm tree, from the sheaths of it, dates thick-clustered, hanging low and near; and gardens of grapes, olives, and pomegranates, each similar (in kind) and yet different (in variety). Look upon their fruits when they begin to bear fruit and ripen. Surely, in all this are signs for a people who believe. Yet some (people) have come to attribute to the jinn a place side by side with Allah, although He created them (all). And in their ignorance they impute to Him sons and daughters. Glory be to Him! Sublimely exalted is He above what they ascribe (to Him). He is the Originator of the heavens and the earth. How could it be that He should have a child, since He has no mate and since He created all things and He alone knows everything? Such is Allah, your Sus­tainer. There is no deity but He, the Creator of everything. Worship then, Him alone, for He has power to dispose of all affairs. No human vision can encompass Him, whereas He encompasses all vision, for He alone is the Unfathomable (All-Subtle) and the All-Aware (Al-An 'am 6:95-103). Say, "All praise is due to Allah, and peace be on His servants whom He has chosen." Is Allah better, or those to whom they ascribe a share in His divinity? Who is it that created the heavens and the earth, and sent down for you water from the sky? For it is by this means that We cause gardens full of loveliness to grow, whereas it is not in your power to cause trees to grow. Could there be any divine power besides Allah? No, they are people who swerve. Who is it that made the earth a place of rest and a fitting abode, and made rivers in its midst, and set upon it firm mountains, and placed a partition between the two bodies of water. Is there a god besides Allah? No! most of them do not know. Who is it that answers the distressed when he calls out to Him and removes the suffering, and has made you in­heritors of the earth? Is there a god besides Allah? How seldom do you keep all this in mind and meditate on it! Who is it that guides you in the darknesses on the land and sea, and sends the winds bearing glad tidings of His coming mercy and grace. Is there a god besides Allah? Exalted is Allah above what they ascribe as partners (to Him). Who is it that originates creation, then repeats it, and gives you sustenance from the sky and the earth. Is there a god besides Allah? Say, "Produce your evidence, if you are truthful" (Al-Nama] 27:60-64). The Originator of the heavens and the earth has made for you pairs from among yourselves, and pairs among cattle, in order thus to cause you to multiply. There is nothing like Him. He is the All-Hearing and the All-Seeing. To Him belong the keys of the heavens and the earth. He enlarges and restricts His provision to whomever He wills. Truly He has knowledge of everything (Al-Shura 42: 11-12). Verily, it is Allah (alone) Who upholds the heavens and the earth so that they will not deviate (from their orbit), for if they should ever deviate, no one could uphold them after He ceases to do so (Fatir 35:41). This is how the Islamic concept deals with the "living God," demonstrating His existence through His creation, and the "willing God," who does what He desires, demonstrating His Will and power through the movements and changes in the universe. Indeed, there is a vast difference between the Islamic concept of Allah and the concept of God presented by such philosophers as Plato, Aristotle, and Plotinus. They describe an "abstract" god which is a creation of their intellect and a product of their logic. It is a god without will power and without any action, and this is because of its assumed “perfection." This assumption then forces them to invent a series of intermediaries or lesser gods between God and creatures, after the pattern of the hypothetical beings that were all too familiar in the pagan mythology of the Greeks. "In Plato's philosophy there are two levels of existence: the level of Absolute Intellect, and the level of matter or substance. Power belongs to the Intellect and submissiveness to substance. Things in the universe possess ranks, higher as they take more Intellect and lower as they take of substance. "God, the Absolute Intellect, is entirely Good and only goodness proceeds from Him. He does not create the mortal existences Himself but delegates this task to lesser gods whom He creates for this purpose. These lesser gods are then intermediaries between God and substance, and they are the cause of evil, sorrow, and imperfection. "Physical phenomena are all illusory, because they change and transform, taking various shapes and forms. Only the abstract Intellect has permanence and reality; and this Intellect is the abode of Forms or Ideas, which are unchanging and eternal. Concrete objects are mere copies of these absolute Forms. "These Forms are the only objects of true knowledge, the unchang­ing realities that our mind perceives when it arrives at a true universal definition. "Every movement has a mover, and that mover in turn has a mover. The chain of movers must stop at that which is itself unmoved, since it is impossible to conceive of an infinite regress in the past. This unmoved mover by necessity must be eternal, without beginning or end, perfect in itself and needing no development (i.e., movement), simple without parts, One not many; and existing independently of all other existents. "Thus Aristotle is inclined to the opinion that the world is eternal, this being more logical. He says in his book Dialectics, however, that the eternity of the world cannot be demonstrated. "We summarize his arguments in this respect: the origination of the world implies a change in the will of God, and God is not subject to change. Supposing that God originated the world, there are then three possibilities after this origination: He remained the same, He im­proved, or He decreased; and, according to Aristotle, all these alter­natives are impossible in relation to God. If, after the origination of the world, God remained the same, then it was a purposeless act, and God is exalted above purposelessness. If by originating the world He improved over what He had been before, then He was not perfect and there was room for Him to improve. That is impossible in respect to God. Similarly, it is inconceivable that God became less perfect by originating the world. “'Now, if we Suppose that God's will is eternal and does not change, then it follows that the existence of the world is coeternal with His will because the will of God (and nothing else) is the cause of the existence of the world; thus the emergence of the effect (i.e., the world) is necessary when the cause is operative, and all causal condi­tions are complete. The postponement of the effects is impossible. "In case of a man it is possible to suppose that he wishes something now but postpones its fulfillment until a later time because of a lack of means or because some conditions for the fulfillment of the wish are not present, or we may suppose that he changed his wish. In the case of God, however, such a supposition is impossible. Plotinus went a few steps further than Aristotle in exalting God. In his view, God is beyond things, beyond attributes, and beyond knowledge. Quoting Professor Akkad again: "Indeed God is beyond existence! This does not mean that God is non-existent or that He is nothing because nothingness is the absence of existence while God is above the attribute of existence in the sense that we can only say, “'One," and cannot attribute anything to this One without destroying its Oneness. It is One, with nothing like it and nothing to be at­tributable to it. "Plotinus reached the conclusion that the One has no knowledge of Itself, as It cannot look at Itself separate from Itself to know It. Therefore, It is purified of this distinction and of the knowledge. These are the best concepts concerning God's perfection and One­ness to be found among the concepts constructed by philosophers. But what is this? A God about whom nothing can be said and who has nothing to do with the real world! Obviously a purely intellectual approach, without reference to the created universe and without the benefit of Revelation, can succeed only in constructing such a pallid and abstracted God that it can have neither existence nor reality. When people get trapped in a purely intellectual approach to the idea of God's perfection, not based on the observation of the real world, they end up with a concept of Perfection that is negatively defined so that no positive attributes such as creating, knowing, willing, and loving can be ascribed to God without disturbing His perfection. When we compare these concepts with the Islamic concept, the meaning of "realism" in the Islamic concept becomes very clear. In the Islamic concept, the Divine Being is active and His Attributes are manifested in actual happenings in the universe. This is how the Qur'an describes Allah's Attributes for human beings and brings them closer to their Lord by giving them a clear and deep understanding of His involvement in their lives and in their environ­ment by using empirical evidence and practical logic. The Islamic concept looks at the universe in the same realistic fashion as a universe composed of things and objects, bodies and forms, movements and forces, and plants, animals, and human beings. This universe is not an "idea" without body or form, or a "will," or "chaos" without form, or a collection of "forms" or "ideas" in the Absolute Intellect. Nor is the universe simply “Nature" as a substitute creator which imprints facts on human mind, nor is it "illusion," nor a "dream" or non-existents, or any other such formulation that can have no counterpart in existence with which human beings can interact. Allah created the universe with an objective existence which we can observe and toward which the Qur'an draws the attention of our minds and hearts. We are asked to contemplate the heavens and this earth, the stars and planets, this world of minerals, plants, and animals, the alternation of night and day and of light and darkness, the rain, lightning, and thunder, and all the phenomena and events that actually take place in a physical universe. When Islam draws man's attention toward natural phenomena as a proof of the existence of the Creator, and of His Oneness, Power, Will, Knowledge, and Dominion, it mentions real objects and real events. It does not talk about the universe as "will" and “idea," or as a mere "form" in the Divine Intellect, or as a "substance" without organiza­tion, or about a universe that is a reflection of the human mind or even a creation of the human mind. Rather we are asked to look at the structure of the objective universe which exists outside the human mind. In the Islamic concept the universe is Allah's origination. He brought it into being by His command, "Be," and it was. The universe obeys His will because it was created as His obedient servant, and whatever He wishes to happen in it does. It is He who has made the sun a (source of radiant light and the moon a light (reflected), and has determined for it phases so that you might know how to compare years and to measure (time). None of this has Allah created without an (inner) truth. He details the signs to a people of knowledge. Surely in the alternation of night and day, and in all that Allah has created in the heavens and the earth are signs for a people who are conscious of Him (Yunus 10: 5­6). Allah is He Who raised up the heavens without any pillars that you can see, and is established on the Throne. He has subjected the sun and the moon [to His law], each one running [its course] to an appointed term. He directs all affairs, explaining the signs in detail, so that you may believe with certainty in the meeting with your Lord. It is He who spread out the earth and set thereon firm moun­tains and rivers. And fruits of every kind He made in pairs, two and two. He draws the night as a veil over the day. Surely in that are signs for a people who think. And on the earth are tracts (diverse though) neighboring each other, and gardens of vines, and sown fields, and palms growing in clusters or singly, watered with the same water. Yet some of them We have made more excellent than others as food. Surely in this are signs for a people who understand (Al­-R'ad 13:2-4). We have set in the sky constellations and beautified them for all to behold (Al-Hijr 15: 16). And the earth We have spread out wide and placed on it firm mountains, and caused (life) of every kind to grow on it in a balanced manner, and made in it a means of livelihood for you as well as for all (living beings) whose sustenance does not depend on you. And there is not a thing in existence whose source is not with Us, and We bestow nothing from on high except in accordance with a well­ defined measure. And We send the fertilizing winds, and send down water from the sky and give it to you to drink, although you do not dispose of its sources. It is We alone who give life and death, and it is We who are the inheritors (Al-Hijr 15:19-23). Are they who are bent on denying the truth not aware that the heavens and the earth were (once) a single entity, which We then separated, and (that) we made every living thing of water? Will they not then believe? And We set on the earth firm mountains lest it shake with them, and We set on it valleys to serve as roads in order that they might find their way. And We have made the heavens as a roof well-guarded. And yet they stubbornly turn away from the signs of this (creation) and (fail to see that) it is He Who created the night and the day and the sun and the moon, each one swimming along in its own orbit (Al-Anbiya 21:30-33). And you see the earth barren. Then, when We send down water upon it, it stirs and swells, and produces vegetation of every kind in beautiful paired growth. This is so because Allah is the Reality, and He gives life to the dead, and He is Able to do all things, and because the Hour is coming without doubt, and because Allah will raise those who are in the graves (Al-Hajj 22 :6-7). Have you not seen that Allah has subjected to you all that is on earth, and the ships that sail on the sea at His command and (that it is He Who) holds back the sky so that the celestial bodies will not fall upon the earth, except by His leave. Surely Allah is, All-Gentle with people and All-Compassionate, (especially since) it is He Who gave you life, and then will cause you to die, and then will bring you back to life. Truly, man is ungrateful (Al-Hajj 22:65-66). And We have created above you seven tracts and We are not heedless of creation. And We send down water from the sky in accordance with a measure and then cause it to lodge in the earth, but, behold, We are most certainly able to take it away. And by means of this water, we produce for you gardens of palms and vines in which you have abundance of fruit and from which you eat (Al-Muminun 23: 17-19). Allah is truly All-Mighty, and All-Forgiving (Fatir 35:27­ 28). What, do they not look toward the sky above them, how We have built it and made it beautiful and free of all faults? And the earth We have spread out and set thereon firm mountains, and produced therein every kind of beautiful plants to be observed and thus offering an insight and a reminder to every human being who willingly turns to Allah. And We send down from the sky water rich in blessings and thereby We produce gardens and fields of grain, and tall palm trees, with shoots of fruit stalks, piled one over another -as sustenance for (Allah's) servants, and We give new life therewith to a land that is dead: thus will be the resurrection (Qaj 50:6-11). Blessed is He in whose hand all dominion rests, since He has the sovereign power to will and do all things, He who created death and life so that He might try you (and thus show) which of you is best in works and (make you realize that) He alone is the All-Mighty, and All-Forgiving. Blessed is He Who created seven heavens in full harmony with one another. You do not see in the creation of the All-Merciful any imperfections. Turn your gaze (upon it) once more. Can you see any flaw? Yes, return your gaze again, and again, and (every time) your vision will come back to you dazzled, weary. And We have beautified the lowest heaven nearest to the earth with lights and We have made them missiles for devils (Al-Muik 67: 1-5). Have you not turned your vision to your Lord, how He lengthens the shadows? If He willed, He could make it stationary. But then, We have made the sun its guide. And then We draw it in toward Ourselves, a contraction by easy stages. It is He who made the night as a garment for you and sleep for a rest, and causes every (new) day to be a resur­rection. It is He who sends the winds bearing good tidings, heralding His mercy, and We send down pure water from the sky so that We may revive a dead land and quench the thirst of what We created, animals as well as humans in great numbers (Al-Furqan 25:45-47). The Islamic concept deals with the universe in this realistic fashion. The universe has an existence separate from Allah's existence, with its own physical and observable characteristics. Islam does not ascribe imaginary characteristics to the physical world, as, for example, is the case with Hinduism. In that religion only "Brahma," the Supreme Deity, has real existence, and in comparison to Brahma's existence this world is nothing, a mere illusion. Because' 'nothing" or illusion is pure evil and imperfection, man's salvation lies in annihilating this evil, which is the physical body, and returning to pure "existence," which has been polluted by intermingling with "non-existence" or illusion. As another example, we mention Plato's concept of the world of Forms or ideas, which alone is real, while objects in the physical world are mere shadows of those Forms. Thus the tree we see over there is merely a shadow of the Form of the Tree concealed in the Absolute Intellect. Each tree, in imitation of the Ideal Tree, loses something and is therefore imperfect. Perfection and real existence are attributes of the Absolute Intellect and its Ideas, while material objects have only a shadowy existence in spite of the fact that we see and touch them. Similarly, Plotinus hypothesized that there is the One, the Deity, from whom proceeds the Intellect. From the Intellect proceeds the Universal Soul. And from the Soul has originated the sensory world whose essence is matter. Matter occupies the lowest level of existence and is pure evil and corrupt. These and similar concepts are the product of human fancy, and are armchair speculations without any basis in the real world of physical objects and observable events. When we compare such concepts with the Islamic concept embodied in the Qur'anic verses, some of which we have quoted above, we understand the meaning of that charac­teristic of the Islamic concept which we have called “realism." In a similar fashion the Islamic concept treats "the human being" in a realistic fashion because it deals with the actuality of millions of persons scattered allover the world. The human being as a generic category has its own special human characteristics and nature. It is made of flesh and blood and muscles and bones, and of mind and personality and soul. Each human being has desires and needs, eats food and walks in the streets, is born and dies, and has a beginning in time and an end in time. Human beings influence and are influenced, they love and hate, hope and fear, ascend and descend, believe and deny, go straight and get lost, build and destroy, conquer and kill, and so on down to the lowest of human characteristics and distinctive features. The Islamic concept is cognizant of all this. O Mankind! Be conscious of your Lord, who created you from a single soul and from it created its mate, and from the pair of them spread abroad a multitude of men and women. And remain aware of Allah in Whom you claim (your rights) from one another, and of these ties of kinship. Surely Allah is ever watchful over you (Al-Nisa 4: 1). O Mankind! We have created you all out of a single (pair)of a male and female, and made you into nations and tribes so that you may know each other. Surely the noblest among you in the sight of Allah is the one who is deeply conscious of Him. Allah is All-Knowing and All-Aware (Al-Hujurat 49:13). Glory be to him who created in pairs all that the earth produces as well as their own (human) kind and other, things of which they have no knowledge (Ya Sin 36: 36). We created man out of the essence of clay. Then We set him, a sperm-drop, in a secure receptacle; then We created of the drop of sperm a germ-cell; then We created from the germ­ cell a lump; then We created within the lump bones; then We clothed the bones with flesh; and thereafter We brought him into being as another creature. Glorified, therefore, be Allah, the Best of Creators! (Al-Muminun 23:12-14). Was there (not) an endless span of time before man (ap­peared -a time) when he was not yet a thing to be thought of. We created man of a drop of sperm intermingled, so that We might try him, and therefore We made him a being endowed with hearing and sight. Surely We have guided him to the way, whether he be thankful or unthankful (Al-Insan 76: 1-3). Doomed is man; how ungrateful! Of what did He create him? Out of a drop of sperm He creates him and proportions him, then makes the way easy for him; then makes him to die, and buries him; and then, when He wills He shall raise him again to life ('Abasa 80: 17 -20). When affliction visits a man, he calls Us (lying down) on his side, or sitting, or standing, but when We have removed his affliction from him, he goes on as if he never called Us during his affliction. Thus do their own actions seem good to those who commit excesses (Yunus 10: 12). When We let people taste mercy after hardship has touched them, then they immediately turn to devising false argu­ments against Our messages. Say, "Allah is swifter (than you) at devising." Behold, Our (heavenly) messengers are recording all that you may devise (Yunus 10:21). And if We let a man taste mercy from Us, and afterwards We withdraw it from him, he is desperate and ungrateful. But if We let him taste prosperity after hardship that has visited him, he will say, "the evils have gone from me," and he is joyous and boastful, except those who are patient and do good deeds. For them forgiveness and a mighty reward is waiting (Hud 11:9-11). And some men have appealing views about (ethics in) the life of this world, and they call on Allah to witness what is in their hearts, and moreover are very skillful in arguing their views. But when such people prevail, they go about the world spreading corruption and destroying man's family life and productive endeavors (causing moral decay and social disintegration). Verily, Allah does not love corruption (Al­Baqarah 2:205). Thus, the Islamic concept views the human being as he actually is. He has characteristics and personal whims, gives and receives, and influences and is influenced. In short, he is not some abstraction or something hypothetical without any basis in reality. The Islamic concept does not deal with an abstraction called "humanity," which in the philosophy of Objectivists becomes almost divine, nor with a personified" Absolute Intellect," which one finds in the idealistic philosophy represented by Fichte. The Absolute Intellect does not have any real existence because there are only individual intellects belonging to real persons. Similarly, there is no such thing as an Intellect that created the Soul or created the universe, as was assumed by Plotinus, the leader of Neoplatonism. 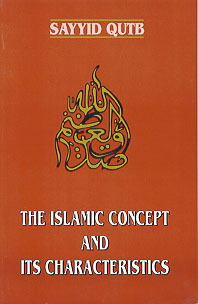 The Islamic concept differs from “Idealism," which deals only with intellectual categories and has no connection with the actual forces operating in the universe and in the lives of real persons. It also differs from "Sensory Objectivism," which has made "nature" the creator of the human intellect and all its perceptions. In the Islamic concept, Allah is the Creator of "nature" as well as of "man." In the Islamic paradigm of thought, the human intellect perceives natural phenomena, discovers natural laws, understands the operation of physical forces, receives sensory impressions from the physical world, and influences the physical world, all according to a balanced and harmonious Divine plan. And who could be better of speech than the person who calls (his fellow-men) to Allah and does good deeds and says, "Truly, I am of those who have surrendered themsel­ves to Allah?" (Fussilat 41 :33). Another aspect of the realism in the Islamic concept relates to the nature of its methodology in the life of mankind and the way it deals with the actual situation of human societies. As was mentioned earlier, the' 'human being" in the Islamic concept is the real human being made of flesh and blood and nerves, with a body, mind, and soul, and with needs and desires, and strengths and weaknesses. He is not some ideal or imaginary being, nor is he an abstract logical entity to be dealt with intellectually. Neither is he the lowest of the low, a product of dead matter, nor merely a creature of "economics." Indeed, every human being is a creature of Allah Most High Who made him His deputy on the earth to manage its affairs. He is to be active and productive and is required to initiate new activities in order to fulfill his duty toward Allah and toward Allah's creatures, whether they be animals, plants, other human beings, or the physical resources of the earth. Islam is a way of life for this physical and spiritual human being, and its system is designed to suit him physically and spiritually, taking into account his biological as well as his mental and spiritual makeup. This system is dynamic, realistic, and natural, in complete accord with human nature. The system of life that Islam desires, with its idealism, loftiness, spirituality, and God-consciousness, is never the less practical and earthy and is within the grasp of every human being. It is suited to man who has to live on this earth, who has to earn his living, walk in the marketplace, marry and have children, and work and play, and who may both love and hate, as well as hope and fear, which are all the human characteristics given to him by his Creator. The system of life that Islam prescribes for man is in accordance with his nature, his capabilities and capacities, and his strengths and weaknesses. It does not denigrate man's role on earth. Muslims do not consider man naturally sinful or evil, nor do they raise him to the status of a god or of an angel, made of light and goodness and free of physical needs and desires. Yet, the humanity of man has a very high status and every man is potentially capable of reaching great heights of perfec­tion at any time and place. We present here, from the text of the Qur'an, a few quotations to illustrate how the Islamic system is suited to the nature of man, while always guiding it toward purity and cleanliness, and toward the highest horizons to which this nature is capable of rising. They say, "What sort of a Messenger is this (man) who eats food and goes about in the market-places? Why has not an angel (visibly) been sent down to him, to act as a warner with him? Or why has not a treasure been granted to him (by Allah)? Or: “He should (at least) have a garden to eat from (without effort)!" These evildoers say (to each other), "If you were to follow (Muhammad, you would follow) a man bewitched!" See to what they liken you (0 Prophet, simply) because they have gone astray and are unable to find a way (to the truth)! Glorified is He who, if He wills, give you something better than that (what they speak about), namely, gardens through which running waters flow, and palaces (Al-Furqan 25:7-10). They say, "We will not believe you until you make a spring gush forth from the earth for us, or until you possess a garden of palms and grapes and you make rivers flow among them abundantly or until you make the sky fall upon us in smithereens, as you have threatened, or you bring Allah and the angels face to face before us, or until you possess a house of gold, or you ascend to heaven, and even then we would not believe in your ascension until you bring down to us (from heaven) a book that we (ourselves) could read." Say “Glory be to my Lord! Am I anything more than a mortal messenger?" (Isra 17 :90-93). Allah does not burden any soul except within its capacity; for it is what it has earned and against it is (only) what it has merited (Al-Baqarah 2:286). They ask you concerning menstruation. Say, "It is a discom­fort, so leave women alone (sexually) at such times and do not approach them until they are clean. When they have cleansed themselves, then go into them as Allah has bidden you to do." Truly, Allah loves those who turn to Him and loves those who keep themselves pure. Your wives are like irrigated cropland for you, so go into this bounty as you desire, and send (good deeds) before you for your souls, and remain conscious of Allah, and know that you are destined to meet Him. And give glad tidings to those who believe (Al-Baqarah 2:222-223). Fighting is prescribed for you, although it may be hateful to you. Yet it may happen that you hate a thing that is good for you, and it may happen that you love a thing that is bad for you. Allah knows and you do not know (Al-Baqarah 2:216). Alluring to people is love of the joys (that come) from women and children, and stored up heaps of gold and silver, and branded horses, and cattle and land. This is the enjoyment of the present life. But in nearness to Allah is the best of all goals (to return to). Say, "Shall I tell you of something better than that? For those who are conscious of Allah, with their Lord are Gardens through which running waters flow, to dwell therein forever, with spouses purified, and Allah's good pleasure. And Allah sees all that is in the hearts of His servants (Ale-'Imran 3:14-15). And compete with one another for forgiveness from your Lord, and for a Garden as vast as the heavens and the earth, which has been prepared for those conscious of Allah who act charitably in both prosperity and adversity and who control their anger and pardon their fellow-men, because Allah loves the doers of good. This garden has been readied for those who when they have committed a shameful deed or have (otherwise) sinned against themselves, remember Allah and ask forgiveness for their sins -and who forgives sins except Allah? -and (they) do not knowingly persist in their transgressions. The reward of such persons will be forgiveness from their Lord, and Gardens through which running waters flow, where they will dwell forever. What a bountiful reward for those who strive in life (Ale- 'Imran 3:133-136). Men shall take full care of women with the bounties that Allah has bestowed more abundantly on men than on women and with what they may spend of their own property (for the support of women). So the good women are the devoutly obedient ones, guarding in (the husband's) ab­sence what Allah would have them guard (their own virtue and the husband's reputation and property). As for those whose ill-will and ill-conduct you have reason to fear, admonish them (first), then refuse to share their beds, and (finally) beat them (lightly). If they then obey you, do not act with continued ill-will toward them. For Allah is Most Exalted and Most Great (Al-Nisa 4:34). So let those fight in the cause of Allah who are willing to exchange the present life for the life to come, for We shall bestow a great reward on whoever fights in the cause of Allah, whether he is slain or is victorious. And how could you not fight for the cause of Allah and for the helpless men, women, and children who are crying, "Our Lord rescue us from this city whose people are oppressors, and raise for us, out of Your grace, a protector, and appoint for us, out of Your bounty, someone who will help us? Those who believe fight for the sake of Allah, and those who disbelieve fight for the sake of idols. So fight against the assistants of Satan. Surely the guile of Satan is ever weak (Al-Nisa 4:74­76). O you who have attained to faith! Be always steadfast in your devotion to Allah, bearing witness to the truth in all equity. And never let hatred of people lead you into the sin of deviating from justice. Be just, for this is closest to being conscious of Allah. And remain in awe of Allah, for surely Allah is aware of all that you do (Al-Ma'idah 5:8). O Children of Adam! Make yourselves (both physically and morally) beautiful for every act of worship, and eat and drink freely but do not waste. For, verily, He does not love the wasteful. Say, "Who has forbidden the beauty that Allah has brought forth for His servants, and the good things of His providence?" Say, "They are (lawful) in the life of this world for all who have attained to faith, and they shall be theirs alone on the Day of Resurrection." Thus do we clearly explain these messages for those of knowledge. Say, "What my Lord has indeed prohibited are shameful deeds, open or secret; and sins and trespasses against truth or reason; and the ascription of divinity to anything other than Allah, since He has never given any authority to worship false gods; and attributing to Allah anything of which you have no knowledge (Al-A 'raf 7:31-33). Many other verses of the Qur'an, prescribing certain obligations or prohibitions for Muslims, prove the realism of the Islamic system of life and its practicality. This system of life is eminently suitable for the nature of man because it takes into full consideration his capacities and limitations, and does not demand anything from him beyond his power or against his nature. This point may be further clarified by contrasting the Islamic system with other systems of life, such as Hinduism. According to Hinduism, people should abstain from nourishing food and from what strengthens their bodies because the soul is imprisoned in the body and is unable to escape from this non-existent and entirely evil "illusion" of the material world, to the real good of perfect "exist­ence" unless a person frees his soul from the prison of his body. Similarly, when we look at the concepts of the Christian Church, we see that most Christians view the human being, a melding of body and soul, an evil combination. The soul is pure, while the physical body is impure, and a person is supposed to sublimate the soul from the lowly physical body. Furthermore, these concepts require actions from people beyond their power or which come in conflict with human nature. For example, in the Catholic Church there is no divorce except in the case of adultery, and even after divorce a second marriage is prohibited. Surely Islam is a practical religion, a religion for this life, for action, for work, production, and progress, and a religion in accordance with man's nature and his role in life assigned by Allah. This din of Allah energizes all the potentialities and powers of the human being and directs them toward the ends for which they have been bestowed. At the same time, Islam establishes ideals of human perfection and motivates every in­dividual to extend himself to the fullest, without impeding his action or denigrating his value and his needs and inclinations. Thus, the Islamic concept's characteristic of realism applies both in the realm of belief concerning Allah, the universe, life, and man, and in the Islamic system of life. They are realistic, firmly founded on a realistic view of man and a realistic view of the circumstances of his life. And there is complete harmony between this Islamic belief and Islamic practice. Thus, man is free, with all his capabilities, to explore this world as Allah intended, to multiply the bounties of this earth and to make changes, and to develop its resources and use them for his own advancement. Islam does not act as a barrier to his beliefs or to his actions because both its system of belief and its system for practical life conform to the system of the universe surrounding him. This is so because both systems of belief and action come from the same unique Source who is also the Source of man and the universe and who has equipped him with the optimum capabilities and capacities to prosper in it. Thus, the man who has attained to faith, and who understands the nature of the Islamic concept and of the Islamic system originating in this concept, participates fully in activities on this earth by re­searching, investigating, and inventing new things, but always in accordance with high moral standards and lofty aims, and with all the characteristics inherent in this concept, namely, harmony, balance, comprehensiveness, dynamism, and realism. In accordance with the natural disposition that Allah has instilled into man, (because) not to allow any change to corrupt what Allah has thus created is the (purpose of the one) ever-true faith. But most people do not know this. (Al-Rum 30:30).